Now that Mother’s Day has just passed, it’s time to start thinking about Father’s Day. It’s right around the corner! Tired of giving Dad the usual gifts? 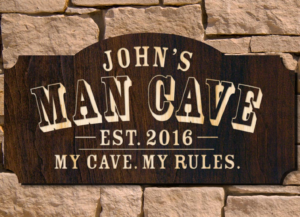 Why not try one of these gifts for his man cave? Delivered in an authentic Man Crates Ammo Can. This is a NATO spec. ammo case: air-tight, waterproof, and virtually indestructible. The Viper Hudson dartboard cabinet is constructed of solid pine with box joints and self-closing hinges. Cabinet doors keep dartboard hidden when not in use and add a touch of class to your rec room. No-mess scoring with dry-erase scoreboard and outchart for quick reference. Does not include dartboard or accessories, but they offer them as well on the website. A Personal Creations Exclusive! Celebrate a special man with an oversized beer mug featuring the dates that changed his life. Glass mug has a sturdy handle and a heavy base with an attractive starburst design. We professionally sandblast it with any title (Dad, Grandpa, etc.) or name, up to 10 characters, and up to 12 “established” dates. Operating via voice control, the Echo Dot can recite daily news, read him an audiobook, blast his favorite dad rock, or even order him a pizza. The Echo Dot can also help out with the chores, including controlling the thermostat, any outdoor sprinklers, and lock any doors. And when you are ready to move up to a home with an even bigger man cave for that special man in the house, The Peters Company would be delighted to help! ← Why Get a Survey?